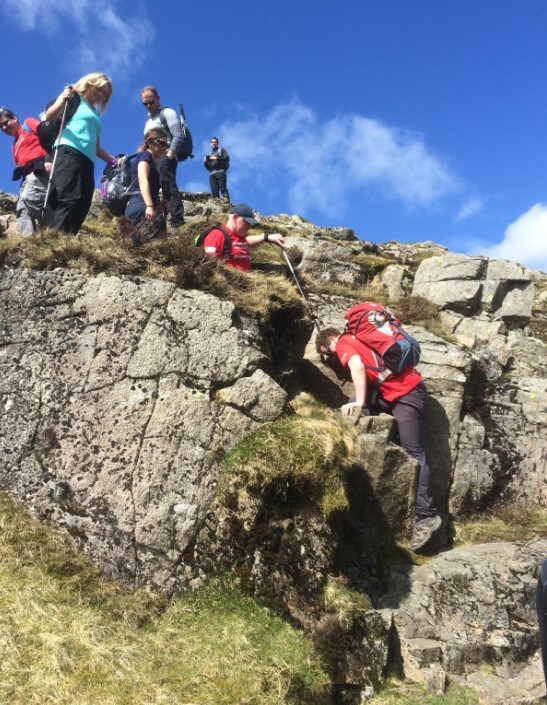 “We decided to tackle these mountains to raise as much money as possible for our Charity Partner, The British Red Cross, to help tackle loneliness in the UK- a fantastic cause. We arrived in Buttermere at 7.30am to stunning views of what lay ahead….and also fabulous sunshine, helping with our enthusiasm to start the adventure. This would be 6 mountains, 14 miles and nearly 6,000ft of ascent! So off we went, starting the ascent up to Red Pike (757m). Thousands of steep steps later, we were about an eighth of the way there….. I’m sure everyone was thinking ‘how can we do 6 of these? !’ We reached Bleaberry Tarn, a small lake part way up Red Pike, then cracked on with the incredibly steep final ascent to the summit. Here we had to tackle scree underfoot, which caused feet to slip and slide on every step- rather unnerving at such a height! The views were absolutely amazing at the top, well worth the fear factor of the prior half hour. The descent from peak 3 was on the verge of impossible. Some chose to take a ‘falling with style’ approach, others simply hoped for the best! At this point, two additional members of our group appeared. They’d had to take a 35 mile detour to Buttermere that morning due to a road closure, but still managed to catch up with the front group even after setting off over an hour later! 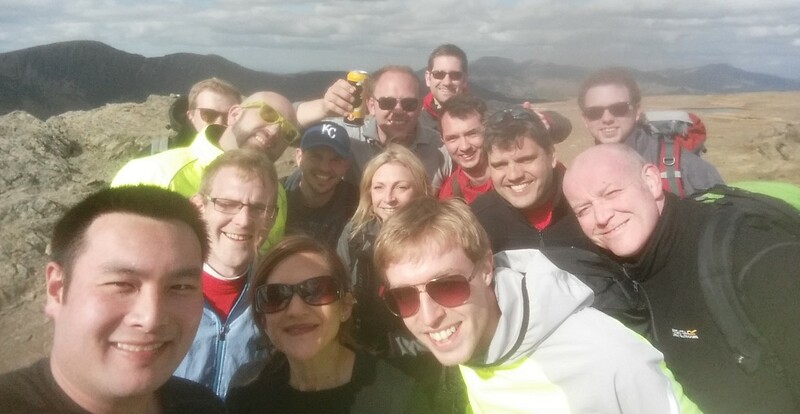 On we trekked to Haystacks (597m), peak number 4. Well, none of us were expecting a full on rock climb at any point in the day, but it certainly added to the mixture of terrain we were faced with! A lot of people thought we weren’t on the right path, but we eventually reached the summit. A welcome short rest and a spot of lunch at the top of Haystacks, then on for miles via a slate mine until we finally reached our resting point, the café at Honister Pass. A cup of tea had never been appreciated more! Adam was our hero of the day. During the first couple of peaks his walking boots gradually decided to completely fall apart, leaving him without soles on both boots! This obviously caused quite a problem, with about 7 hours left to trek! 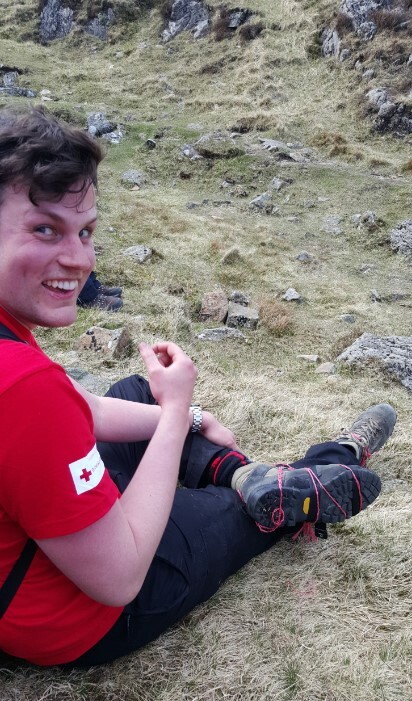 Handily a member of the team had some string with them, so his boots were wrapped up to keep the soles temporarily attached- although not ideal! Reaching the café at the end of the 4th peak, Adam made the decision to catch a bus back to his car. Rather than giving up at this point, he found a pair of trainers in his car, drove back to the bottom of the 4th peak and carried on! What a trooper! The final 2 peaks now awaited us, with peak number 5, Dale Head (753m), causing frustration to most with a relentless steep ascent. We were fooled by a number of false summits on the way. One more to go! We headed to our final peak, Robinson (737m), with legs just about working and a variety of back and knee pain very evident. But we made it!!! It was at this point that a couple of hip flasks and a can of beer made an appearance! The final descent was incredibly steep and very knee-jarring, but the end was in sight! Finally, 9.5 hours later, we were done!! The pub at the end was very welcome, where we all collapsed into heaps. Although exhausted and almost broken, we’d supported each other all the way to the finish line. Could you take on a challenge event to support the campaign to tackle loneliness? Get some ideas and sign up here! If you have already signed up to do a challenge event for British Red Cross but haven’t notified them that you’re doing it as part of the Co-op partnership make sure you fill in this form! You’ll find that the top atmosphere before 10pm is Irish and Sports bars. from the West Coast is over the New Madrid Fault. Valencia Football Club – There is a great deal of popularity and craze to the club which is known as Valencia FC.